This winter has already witnessed an unprecedented increase in cases of Norovirus – the so-called ‘winter vomiting bug’. For some reason, across the globe, the infection has spread with increasing virulence and also lingered longer than normal in parts of the world now moving from spring to summer. Norovirus is an especially durable and adaptable virus. It is perfectly suited to what it does; spreading from person to person either through airborne contact with minute particles of vomit, or through surface contact with the virus…on some surfaces it can last for up to two weeks. Given that I have a pathological phobia of vomiting, this one is the stuff of nightmares! In Britain, the Health Protection Agency is the public face of public health and is charged with providing a virtual barometer of sickness. Their website contains a list of the current maladies doing the rounds and, in the case of flu and norovirus, weekly updates on the numbers of the stricken. The site also contains tips on how to prevent the spread of the virus and some advice (if little comfort) to those who have already succumbed. To my mind, the information on the HPA website is extremely reminiscent of the information disseminated to the public in past times of epidemic disease – say the seventeenth-century plagues. It strikes me that authorities throughout history have had to balance the need to provide practical details of encroaching sickness with the need to avoid spreading panic. The language of sickness reporting in fact has a long history, and show remarkably similar patterns. The reporting of the numbers of sufferers, for example, is something that was certainly an important element in the way the Great Plague of 1665 was reported. 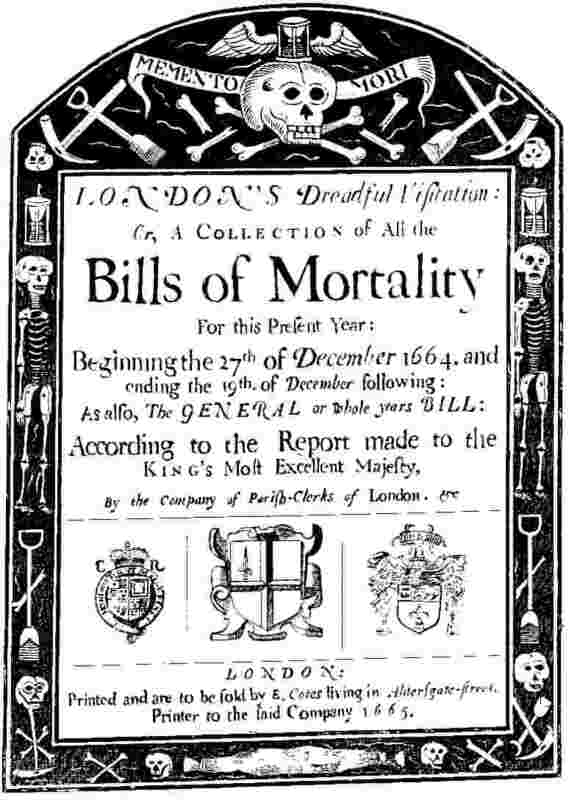 In seventeenth-century London, the so-called ‘Bills of Mortality’ gave a weekly update on deaths in the city, in the form of a published pamphlet. Information for these pamphlets was gleaned from the ‘searchers of the dead’ – people (often women) who were employed to examine fresh corpses to discern the cause of their demise. Their diagnoses were diverse. In one bill dating from 1629, the causes range from predictable conditions such as measles, cold and cough and gout to other, stranger, ones such as ‘teeth and worms’, ‘excessive drinking’ and ‘suddenly’! As the plague increased though, the Bills of Mortality became rapidly dominated by these numbers, and Londoners pored over the pages every week to gauge the seriousness of the situation. News of the contagion was a regular topic of conversation and people were eager to learn if things were getting better or worse. The newly burgeoning cheap presses of the mid seventeenth century went into action, with everything from treatises on the causes of the plague to ‘strange newes’ about the latest outbreaks or figures and even popular cures. The authorities were clearly worried about the danger of epidemic sickness, and took measures to try and limit its spread. One of these was to try and restrict popular gatherings such as fairs, to try and prevent the disease running rampant. This Royal proclamation from 1637, for example, entreated people not to attend the popular Sturbridge Fair that year, the king ‘Forseeing the danger that might arise to his subjects in generall”. So, the authorities published the numbers of sufferers, took preventative measures against the spread of contagion and, in general, maintained a dialogue with the public, updating them on disease types, currency and potential ways to avoid them. The popular press also served to stir up fears, however, and perpetuated public dialogue about infection. Disease and health have always been topics of conversation but, in times of contagion, they tend to become more concentrated, and people become more engaged in dialogue about them. Fast forward to 2013 and it is remarkable how similar the situation still is. The HPA website, for example, gives a weekly update on numbers of norovirus sufferers, not only in terms of clinically-reported cases, but of an assumption that for every reported case there are a further 288 or so unreported cases – people who simply decide to stay home and self-medicate. Indeed, at the present time, people are being actively discouraged from attending doctors’ surgeries, and hospital wards are being closed to the public. The impression is one of a wave of contagion breaking over the British Isles and, for me at least, one that is coming to get me! There is indeed a fine line to tread between reporting facts and sparking panic. When SARS first emerged, there was a great deal of information (and misinformation), with various ‘experts’ calling it variously a massive threat to humanity, or simply the latest in the processional line of epidemics to afflict humankind. A few years ago, a virtual global panic was instigated by the apparent mutation of avian flu, or bird flu. This outbreak made ‘pandemic’ the buzzword of the late 2000s and, again, much space was devoted (and indeed still is to some degree) on educating people on what it is, who has got it, and how to avoid it. In 2005, a UN health official warned that bird flu was capable of killing 150 million people worldwide. According to Dr David Nabarro, speaking to the BBC at the time “”It’s like a combination of global warming and HIV/Aids 10 times faster than it’s running at the moment,”. The World Health Organization, perhaps seeing the potential panic that this could cause, immediately distanced itself from the comment. The fact that the outbreak was ultimately relatively mild emphasises the problem that epidemic disease causes for health officials. How to alert people without scaring them? The same pattern is now happening with the norovirus – although clearly this does not carry the same levels of danger. Here we are talking about contagion, rather than mortality. Let’s take the headline on the Western Mail newspaper of 20th December though: “Norovirus: Now more wards are closing as hospitals in Wales hit”. The breathy style of this banner line emphasises its rapidity, not just a straight report, “NOW” it’s coming. What purpose do these reports ultimately serve? Put another way, why do we need to be told? Logically, if preventative measures are possible then it makes sense to tell as many people as possible. But often this is not the purpose of newspaper copy in times of sickness which, to me, almost seems at times to be deliberately provocative. The answer seems to be a deeply-set human interest in sickness, ultimately linked to our own mortality. Even in this apparently scientific and modern age of medicine, there are still many things which are incurable, and many diseases which have the ability to wipe us out at a stroke. It is this uncomfortable reality which perhaps continues to fascinate and frighten us. We live in an age of control, but some things are still beyond our control, and it is perhaps this innate fear of disease – of our own transience – which makes these headlines ultimately so compelling.